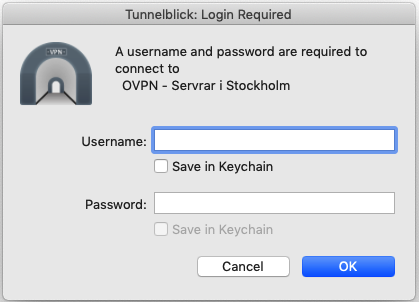 To connect to OVPN you first need to download Tunnelblick. Double-click on the file you downloaded in the previous step and go through the installation process. Double-click the file to extract the contents. You will see a file ending with .tblk. Double-click the extracted file. If nothing happens when you click it, try holding down the Ctrl-key and and choose the alternative Open. Choose Only Me. 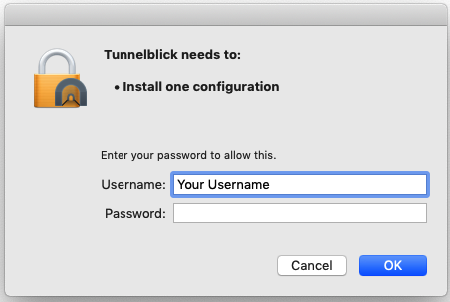 You might need to enter your password in order to allow Tunnelblick to install the configuration file. The tunnelblick icon, which looks like a tunnel, should be visible on the upper right corner of your screen. Click the icon connect to the configuration file you downloaded. Select Save to keychain if you want Tunnelblick to remember your login credentials.